Rattlesnake Canyon offers a quick route into the most unusual landscape in Joshua Tree National Park - the Wonderland of Rocks, where huge, rounded monzonite boulders and cliffs extend for about ten square miles, forming a generally hostile environment crossed by occasional narrow, sandy ravines that provide the best means of access. 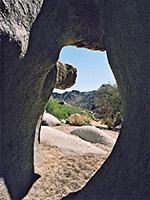 The two official entry points are at the south end near Barker Dam and from the east along the Willow Hole Trail, though Rattlesnake Canyon on the north side is also quite popular, and has the added advantage of starting right next to the Indian Cove campground - beside a picnic area at the end of a side road one mile east of the camping area. Like several other Joshua Tree campsites (Belle, White Tank and Jumbo Rocks), Indian Cove has a very scenic setting, with many well-separated sites right beneath the monzonite rocks, a scene especially pretty at sunset. 10 views of Rattlesnake Canyon. There is no official trail up Rattlesnake Canyon but many footprints indicate the way, along a sandy wash that soon enters a ravine bordered by the light grey, rounded granitic rocks on one side and darker, more jagged cliffs of Pinto gneiss on the other. The canyon bends 90 degrees, passes a section filled with large boulders then gains height more steeply via a thin, slot-like channel containing dryfalls and potholes between swirling, water-carved walls. Pools persist in some of the deeper potholes all year, while in wet weather the slot may be filled by quite a substantial stream. This pretty obstacle may be passed by scrambling round on the left side, then, after more boulders, pour-offs and ledges, the streambed becomes quite flat and sandy, edged by a few cottonwood trees, as it enters a V-shaped canyon through the monzonite rocks. Progress is easy for another half mile, past just a few blockages formed by large boulders in the streamway, but then the gradient increases again as the rocks become larger; it takes much longer to go further up the streamway though this is still quite possible, by a combination of climbing and walking. One possible hike is to link up with the Willow Hole Trail, a journey right across the Wonderland of Rocks of about 6 miles.